These chemical reactions are catalyzed and coordinated by proteins. 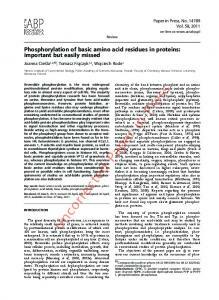 ... amino acids are not directly and simply condensed into polypeptides through catalysis. 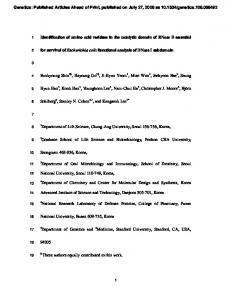 ... living organisms and is conspicuous by its absence in all non-living organization of ..
Nov 25, 2018 - 0 1984 by The American Society of Biological Chemista, Inc. vol. 259, No. .... 800 V (constant) until the pH gradient was fully developed and the. vol. 259, No.22, Issue of November 25, pp. 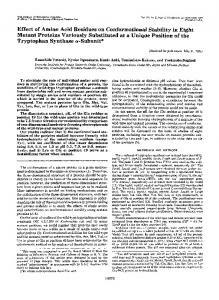 14076-14081 1984 Printed in &s.A.
0 1984 by The American Society of Biological Chemista, Inc.
To elucidate the role of individual amino acid residues in stabilizing the conformation of a protein, the stabilities of wild-type tryptophan synthase a-subunit from Escherichia coli and seven mutant proteins substituted by single amino acid residues at position 49, which is buried in the interior of the protein, were compared. The mutant proteins have Gln, Met, Val, Tyr, Leu, Ser, or Lys in place of Glu in the wild-type protein. 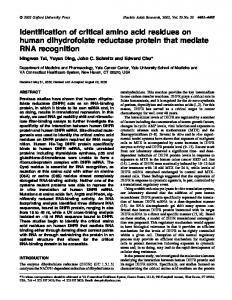 The dissociation constant, pK, of the Glu residue at position 49 for the wild-type protein was determined to be 7.5 from atitration curve obtained by comparison of two-dimensional isoelectric focusing electrophoresis of the wild-type and mutant proteins. Our results indicate that 1) the conformational stabilities of the proteins studied increase linearly with hydrophobicity of the substituting residues (except Tyr), with the coefficient of this linear dependence being 2.0, 3.4, or 1.3 at pH 5.5, 7.0, or 9.0, respectively; and 2) Lys or Glu at position 49 serve as a destabilizing factor when ionized. The a-subunitof tryptophan synthasewas isolated from the PW11, trpA3, trpAl1, trpA33, trpA88, Ser49, Lys49, and Leu49 strains of E. coli. 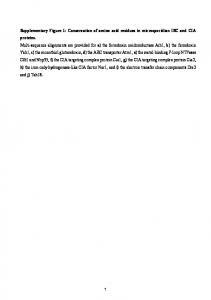 The peak I and I1 proteins from PWll were used as the wildtype and N-terminally formylated a-subunit, respectively (9).' 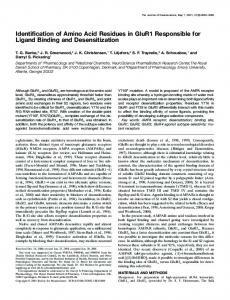 The The conformation of a native protein in a given environ- Ser49, ku49, and Lys49 strains were obtained from an amber mument is determined by the amino acid sequence (1).Therefore, tant at position 49 (10) by lysogenizing with a specialized transthe three-dimensional structure of a protein should be pre- ducing phage X carrying the S U I + suppressor gene, h? 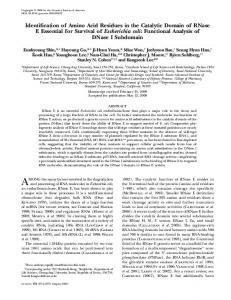 'psul+h, the sy+ dictable in theory onthe basis of the amino acid sequence. In suppressor gene, hps~~+cI857h,andthe s y + suppressor gene, practice, however, the prediction of three-dimensional struc- X:'u-ampsuP+, respectively, all of which were provided by Dr. Ozeki (11). 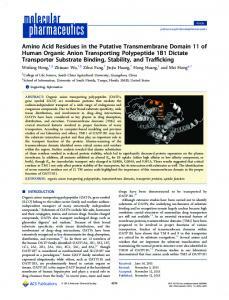 The trpA3, trpA11, trpA33,and trpA88 strains (12) were donated ture from a given amino acid sequence has yet to be realized. by Drs. 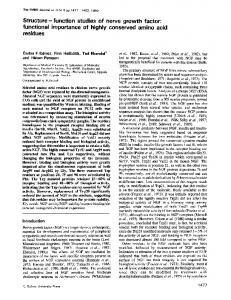 Yanofsky (Stanford University) and Crawford (Iowa UniverMore information is needed on folding mechanisms and on sity). 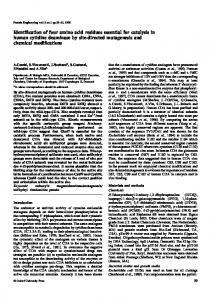 The trpA3,trpA11,trpA33,trpA88, Ser49, Leu49, or Lys49 the stabilization of the three-dimensional structure, and their strains have Val, Gln, Met, Tyr, Ser, Leu, or Lys, respectively, in relation to the amino acid sequence. One approach to under- place of Glu at position 49 of the a-subunit. The purifications were standing therole of the aminoacid sequence in protein folding performed as described (13). Purified a-subunit monomers gave a and protein stability is to study the effects of single amino single band on isoelectric focusing in all cases. Guanidine hydrochloride, specially prepared reagent-grade from Nakarai Chemicals, acid substitutions on conformational stability using mutant Kyoto, was used without further purification. 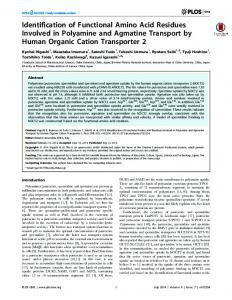 Other chemicals were proteins (2-8). reagent-grade. On the basis of studies of the wild-type tryptophan synthase Protein concentrations of the wild-type and mutant proteins were 5: 4.8 for a-subunit (EC 4.2.1.20) of Escherichia coli andits many estimated from absorbance at 278.5 nm, assuming mutant proteins, we could suggest that proteins may easily Tyr49 and 4.4 for the other proteins (14). Acid-base titrations of protein samples were carried out under become more or less stable as a result of single amino acid humidified nitrogen in a water-jacketed cell at 10 "C with an Orion substitutions (2). Conformational stabilities for the wild-type Model 701A pH meter. 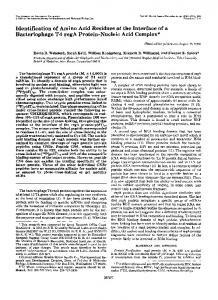 In each experiment, 4.0 mlof the protein and the mutantproteins substituted by Gln, Ser, Met, Val, or solution, which had been dialyzed against 0.15 M KC1, were placed in Tyr in place of Glu at position 49 have been estimated by the the titration cell thermostatted at 10 "C. Then either HCI (0.004-0.5 calorimetric method or by anaIysis of denaturation inguani- N) or KOH (0.004-0.5 N) was added in portions of 15 pl from a calibrated Gilson pipette. The pH was measured after the solution *This work was supported in part by Grant 58580112 from the The abbreviations used are: G1u49 and formylated protein, the Ministry of Education, Science, and Culture of Japan to K. Y . 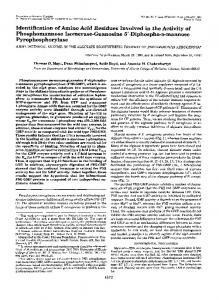 The costs of publication of this article were defrayed in part by the wild-type and N-terminally formylated tryptophan synthase a-subpayment of page charges. This article must therefore be hereby unit, respectively; Va149, Gln49, Met49, Tyr49,Ser49, Leu49, or Lys49 marked "advertisement" in accordance with 18 U.S.C. Section 1734 mutant proteins substituted by Val, Gln, Met, Tyr, Ser, Leu, or Lys in place of Glu at position 49 of the wild-type a-subunit, respectively; solely to indicate this fact. GdnHC1, guanidine hydrochloride. $ To whom correspondence should be sent. were cut away, and new electrode strips were overlaid onto thegel a t right angles to those of the first run. A filter paper strip of about 0.7mm width was overlaid perpendicular to the preformed pH gradient a t the appropriate position. Approximately 40 pl of sample (2.5 mg/ ml) were applied to the stripwith a microsyringe, and the stripwas taken off a few minutes later. The second run perpendicular to the pHgradient was performed for 15-18 min a t lo00 V (constant). During electrophoresis the temperature was maintained constant. Before staining, the pH was measured on the gel surface by using surface electrode (LKB 2117-111). CD measurements were carried out with a Jasco 5-500 recording spectropolarimeter equipped with a data processor for CD (Model DP-501). Denaturation by GdnHCl was examined a t three different pH values for Leu49 by following CD values a t 222 nm as described (3). FIG. 2. Titration curves by electrophoresis perpendicular to preformed pH gradient. Protein mixture in a, b, and c contains Glu49 + Va149, Glu49 + Ser49, and G 1 d 9 + formylnted protein, respectively. That in d contains Glu49 + Val49 in the presence of 8 M urea. a, b, and c were done a t 15 "C and d a t 25 'C. S represents the start line of each sample. The anode was at theupper end in each gel. pH was measured on the gel surface a t 3cm distance from the sample line a t intervals a t 1 cm. The length of each slab gel was about 23 cm. PH FIG. 3. The difference between mobilities of two proteins in two-dimensional electrophoresis. a,and b were obtained from the data of Fig. 2, a and c, respectively. Distance moved was read by a digitizer (Mutoh Bit Pad One). The midpoint of the curve in a or b represents the apparent pK for the Glu residue at position 49 or the a-amino group of Glu.49, respectively. FIG. 4. Correlation betweenthe Gibbs energy change of unfolding in water of the wild-type and mutant proteins and the hydrophobicity of the substituting residues at position 49. The dataexcept for Led9 are taken from Ref. 5. Age represents the value of the Gibbs energy change (21) for transfer from ethanol to water of amino acid residues. The value for ionized Glu residue is taken from Levitt's estimation (22). Top, at pH 9.0 and 25 "C,middle, at pH 7.0 and 25 "C;bottom, at pH5.5 and 3 "C. a, transition from the native to the completely unfolded form, AC3'; b, transition from the native to the intermediate form, AG?'. FIG. 5. 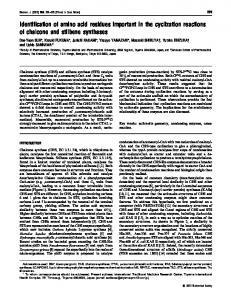 Effect of pH on stabilities of the wild-type and mutant proteins.a, change of CD values at 222 nm of Glu49 (01, GIN29 (A), Met49 (e),Vu149 (W), Ser49 (O), and Tyr49 (A)as functions of pH in the absence of denaturant. In the acid region (below pH 7), CD at 222 nm and pH were measured at 3 "C after the samples were kept 2 h at 3 "C. In the alkaline region, CD at 222 nm and pHwere measured at 25 "C after 30 min at 25 "C. pH was adjusted by addition of HCI or KOH. All experiments were done in 0.15 M KC1 containing 0.1 mM EDTA and 0.1 mM dithioerythritol. 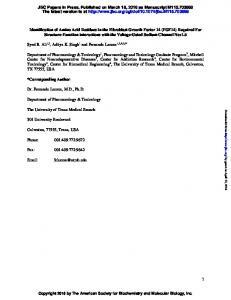 CD measurements were performed at protein concentrations of 0.02 to 0.04 mg/ml using a cell with 10-mm path length. The CD value at pH7 is taken asunity. 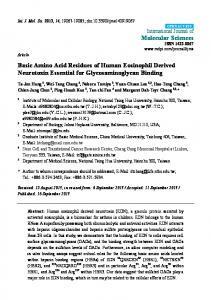 Results for Glu49 and Gln.49 have been reported (4).b, residual activity of Glu49 (0)and Lys49 (e)as a function of pH. After the sample was incubated in a solution containing 0.1 mM EDTA and 0.1 mM dithioerythritol for 30 min at 53 "C and the respective pH, activities were measured by the consumption of indole after reaction at 37 "C and pH8.0 for 20 min in the presence of pyridoxal phosphate, serine, and the⊂unit of tryptophan synthase (23). were measured for Lys49 and Glu49 as a function of pH, although this measured irreversible denaturation. 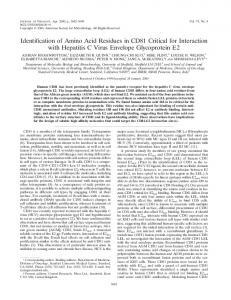 Lys49 was more labile in the acid region and more stable in the alkaline region than Glu49. 8. Schellman, J. 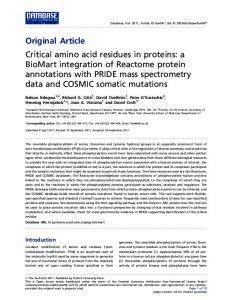 A., Lindorfer, M., Hawkes, R., and Grutter, M.
Report "Effect of Amino Acid Residues on Conformational Stability in Eight"